As the year drew to a close, Swift sold the Roseburg News-Review, a subscription-based broadsheet that caters to an older demographic (like The Union) around the same time it bought another newspaper in a mountain resort town (like its Vail Daily and Aspen Times). And this is a hoot: the newspaper Swift bought, the Park Record in Park City, Utah, was once in the hands of my great-grandfather’s family (more details below). •In September, without fanfare, Swift sold the Roseburg, Ore., News-Review to Roseburg-based Lotus Media. It was announced on Sept. 3 in a mere five-sentence article in the Roseburg newspaper. Jeff Ackerman (once a publisher of The Union) “will continue” as publisher and editor of The News-Review and http://www.nrtoday.com, according to the Sept. 3 press release. “I’m pleased to be part of this local ownership and looking forward to running what is now a locally owned and operated independent newspaper,” Ackerman said in the press release. The local television station report is here. Yet a few months later, on Dec. 20, Ackerman announced he was retiring from the Roseburg, Ore., newspaper on New Year’s Day. He wrote: “It’s time for a parade. ‘Jeff,’ a guy once advised. ‘If they decide to run you out of town, get to the head of the line and make it look like a parade.’ I’m retiring New Year’s Day, and I can’t think of a better day for a parade.” Ackerman and the Roseburg, Ore., newspaper no longer appear on Swift’s corporate website. It will be interesting to see how this unfolds. 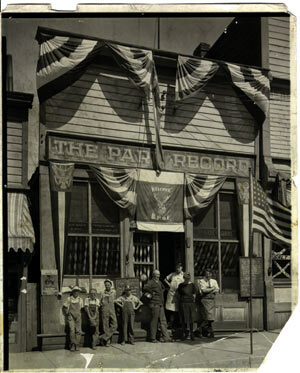 As an aside, The Park City Record was in the hands of my great-grandfather Raddon’s family in the late 1800s. More details are here. I was close to my great-grandpa as a child; he later went to work at the L.A. Times. My grandmother and I also discussed his newspaper life. I did not read about either the sale of the Roseburg newspaper or the purchase of the Park Record in The Union, but it would be interesting to know exactly how Nevada-based Swift feels The Union (a subscription-based broadsheet that caters to an aging, declining demographic) is a good long-term fit for the company. My own thinking is that The Union is a better fit for The Auburn Journal’s owner, Gold Country Media, rather than Swift, but that’s just a personal opinion. Gold Country Media is owned by another out-of-town newspaper chain, Brehm Communications of San Diego. At any rate, the newspaper industry is in a great state of flux in the New Year and beyond. And our community is touched by this. My Mom’s cousin passed this on: My great grandfather and his brother ran the Park City (Utah) Record newspaper at the turn of the century, as owners and co-editors. Later, William Raddon went to work at the Los Angeles Times after he moved his wife, Chloe, and six daughters to Los Angeles. He went back to The Times during World War II after the press room was depleted by younger men being drafted. • During Sam Raddon’s colorful tenure, the newspaper covered Utah’s fight for statehood, the Great Fire of 1898 that destroyed more than half of the town and a tragic accident in the Daly West mine that took 34 lives. The subscription-based Grass Valley broadsheet (AKA The Union) increasingly looks odd in the mix of Swift properties.